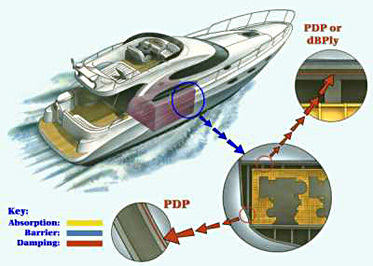 PDP is a self contained viscoelastic layer that can be incorporated into FRP (Fiberglass Reinforced Plastic). PDP is light weight and the viscoelastic layer has been optimized to raise the typical sandwich panel’s loss factor 5 to 10 times over a wide frequency range, which leads to a reduction in sound radiation and an improvement in transmission loss by 7 – 10 dB. 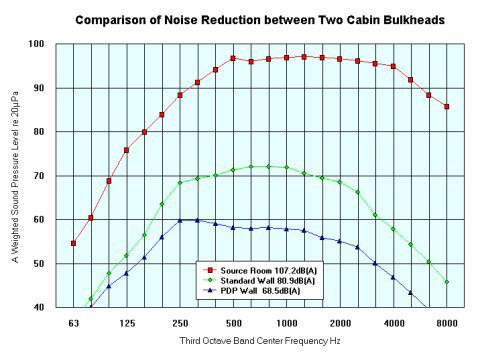 The sound pressure levels measured in a boat before and after PDP had been added to the engine room bulkhead wall showed an improvement in sound insulation of between 5 and 15 dB in the frequency range 125Hz to 4KHz. This damping material when used in combination with American Acoustical Products’ sound absorption materials such as Hushcloth® and Hushpanel can give levels of comfort normally only achievable by installations incorporating extremely heavy standard acoustical materials.